The moment is finally here. Be the first to sign up for Handmade Beauty Box! Sign up on our Kickstarter page and see our first video, project photos, and the website homepage. So many sneak peeks to be seen! The Handmade Beauty Box website is scheduled to launch in the beginning of November 2014. We know it’s hard to wait, so we’re offering an early opportunity to sign up on Kickstarter before the website launches. But it’s far more than just signing up for the box, we’re reaching out to Kickstarter fans hoping you’ll join our journey as we dive into the DIY subscription world. We’re looking for YOU to be a part of our product development team. We want to hear your ideas and follow up with you after your first shipment. What did you like and dislike about your first box? What would you like to see in future boxes? You’ll have exclusive access to the director of the company (AKA Courtney whom you may remember from here and here) to talk all things DIY beauty and spa. The first round of boxes will ship in December and here’s a clue for Kickstarter supporters only – you’ll be able to make eight products that may or may not (wink wink) fit into stockings (if you catch our drift – hint hint). We are so passionate about this new business venture and we aim to make crafting as fun and simple as possible. Wouldn’t it be great to replace some of your day to day beauty products with your handmade recipes where YOU control the ingredients? You’ll know exactly what’s in your soaps, eye shadows, lotions, and lipsticks and our recipes typically make more than one so you can share with friends and family. Or better yet, craft with your friends and family! Don’t forget to share this blog post with your crafting buddies. They wouldn’t want to be left out. 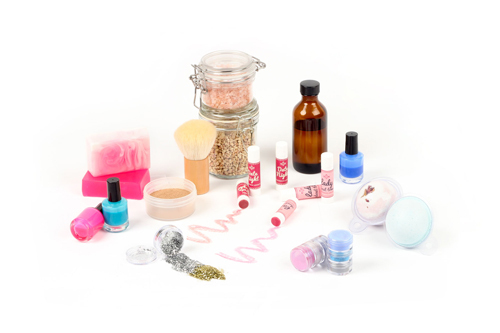 Want to know more about DIY beauty? Follow the Handmade Beauty Box social media accounts: Facebook, Twitter, Instagram, and Pinterest. So occasionally when I get bored I will surf through blogspot to look at other blogs. Well, I happened to stumble across your blog, and I am glad I did. I absolutely love subscription boxes and often write about them. I not only like your site, but I think this is a wonderful idea. I love that there isn’t anything on the market like this. Trust me I know I think I have recorded over 300 different subscriptions over the year that I have either wrote or read about. There are DIY subscriptions but no DIY beauty subscriptions. I am very interested to see how this goes, and I hope that you will have a lot of success with it. Wow, thank you so much for your kind words! We are very excited for this service and are so glad you are as well. I mulled this over for a day and finally just signed up for the 3 month. I do not do a lot of beauty item creations – just CP soap- and want to make sure it is something I like and am capable of doing. Now I am getting excited about it! I do not visit social media sites (except BB’s blogs) so I am wondering if the support blog could also be made part of ‘Teach Soap’??? That’s awesome, thanks so much for signing up! This service will allow you to try a lot of new DIY projects, like lip balm, bath bombs and makeup. That said, this one is wayyy over the pledge amount – great job Kelsey! Absolutely. Did you guys make the video in house as well? I always loved the idea of subscription boxes since they are like opening up a Christmas gift every month (like you guys mentioned on the video). The video was shot by a local videographer in Bellingham, WA! He also shoots the Soap Queen TV episodes. Thanks for the quick link Kelsey. Subscribed. You guys are keeping the content original. My question is the same as Penny and Natalie – is this to be a month by month subscription where you’re automatically billed for each months’ shipment? Or are we expected to pre-pay for the whole year? Or is this must for the initial kick-off and then the website will allow me to sign up for the subscription? If you purchase the box right now, it will be one lump sum. So if you choose three months, you will be charged $90 right away. However, when the service officially launches in November, you will pay the service month to month. Basically, the Kickstarter campaign is a way for you to buy the boxes now before the website launches! Please can you include Puerto Rico? We are part of USA and the ship via USPService is the same,we are a lot of soapmakers interested!! Dont treat us like international ,we are NOT!!!Thanks! Is this price to ship to Canada too? Or just the US? This service is only available to the lower 48 states in the U.S. Sorry about that! So if we wait to sign up when the web page launches, would we still be able to get the same box as the Kickstarter funders? I want to sign up, but I could really only afford a month-by-month subscription (if even that). I’m not too keen that if I purchase the single box on Kickstarter, I’d have to sign up again when the website does launch. If you wait for the official launch, you will get the same boxes as the Kickstarter campaign. This campaign allows you to pay one lump sum for the boxes. So if you choose three months, you will be charged $90 right away. Also, you would have to sign up for the service again. Hi. I am having a hard time understanding this. How do i sigh up for the monthly box and do you take the money out of my account each time. I thought i had sighed up for this already. 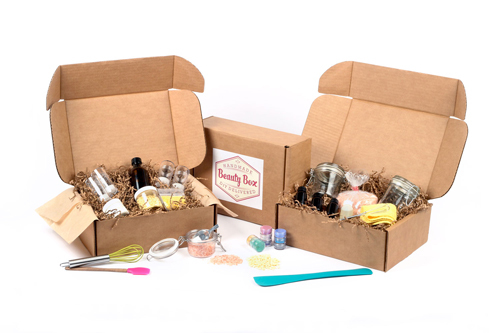 To sign up for the monthly subscription, check out the Handmade Beauty Box Kickstarter page. On the right side of the screen, you can see all your options. For instance, if you pledge $32, you can get a box in December. If you pledge $90, you can get a three-month subscription. Basically, the Kickstarter campaign is a way for you to purchase the boxes now before the website launches! Also, I believe you signed up for the Handmade Beauty Box newsletter, which sends information about the subscription service. Signing up for the Kickstarter campaign allows you to purchase the boxes themselves. Sorry for any confusion!